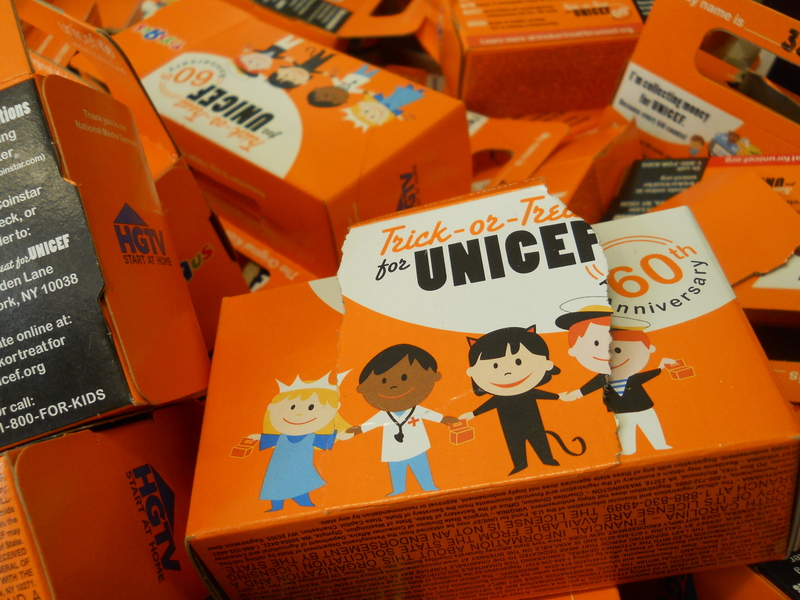 UNICEF Halloween collection boxes. Photo by Brynn Stevens. The UNICEF Club is the Andover High School branch of the global UNICEF Organization. They work to earn money for children in third world countries and to raise awareness of the hardships these kids deal with everyday. The money goes toward paying for mosquito nets and medicines to prevent malaria. It also goes toward funding child education. This year’s campaign is “Believe in Zero” — reducing the number of children dying from preventable causes from 21,000 deaths a year to 0 deaths…period. The members of the UNICEF Club wear a “21,000″ pin around school to further raise awareness. The UNICEF Club’s Halloween fund-raiser was a remarkable success thanks to the students’ donations. UNICEF Club members went from class to class each morning with the recognizable orange UNICEF boxes collecting donations. The most charitable classroom was room 312 with a total donation of more than $100. The members also sold some baked goods after school and candy packages at lunch. Vice President Syona Shetty said that they had to get special permission from the school to sell the candy due to health regulations! In total, all of the student and faculty donations added up to more than $750! Lots to look forward to this month — don’t be surprised if you hear caroling in the hallways. Keep your eyes and ears open for these awesome events. “We hope the school continues to be as supportive as it is now!” said Vice President Syona Shetty. To learn more about the club or the organization, e-mail the presidents at ahsunicef@gmail.com, or come to UNICEF club on Mondays in room 311. All new members are welcome!